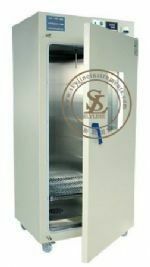 High temperature oven can provide a stable testing space for pre-heating, drying, changes about physics and chemistry testing. It adopts precision temperature controllter with high stability of platinum resistance to temperature that makes temperature well-distribution. It is applicable to a variety of products, materials, electric, instruments, meters, components, electronics, electricians and automobiles, aviations, plastics, machinery, chemicals, foods, chemicals, hardware tools for doing drying test and various constant adaptive tests at an constant temperature condition.